Maundy Thursday is the night of the institution of the Lord’s Supper. This sermons keys off of two things: 1) the idea of preparation. 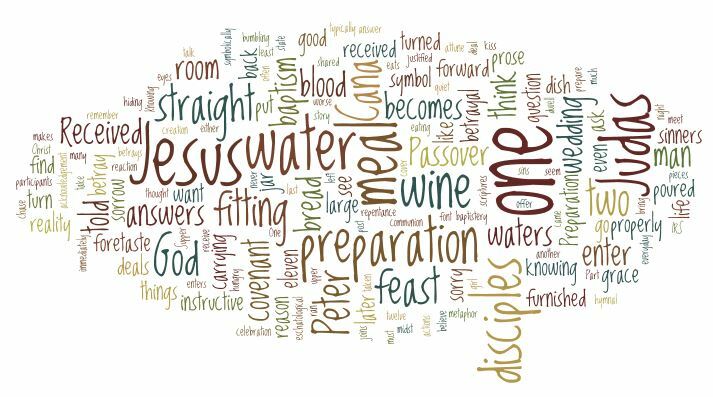 The disciples asked what they needed to do to prepare the Passover. What is a fitting preparation for the Lord’s Supper? The text helps us answer this. 2) What are the effects of reception? There are two groups who receive the first – the 11 represented by Peter and 1 represented by Judas. Again in this we get a glimpse of our answer. This entry was posted in podcast, Sermons and tagged grace, Lord's Supper, Mark 14:12-26, Maundy Thursday. Bookmark the permalink.